We visited the town Jagodina yesterday to attend the 3rd workshop within the Support, Not Perfection program. We couldn’t even imagine the workshop would be full of surprises and wonderful stories that inspired us all. Moms and dads excitedly shared their experiences, awarded each other with applauses and with great relief spoke about some of their parenting dilemmas. And baby Katarina watched all of that, smiling from time to time as if she wanted to tell everyone “Hey, you have my support, too!”. We thought parents would be tired and they wouldn’t actively join the discussion, as it was already evening and everyone came there right after work. But we were wrong! A chatter of happy parents welcomed us. They were sharing what had happened after the previous workshop and how they succeeded in applying some of the tips. 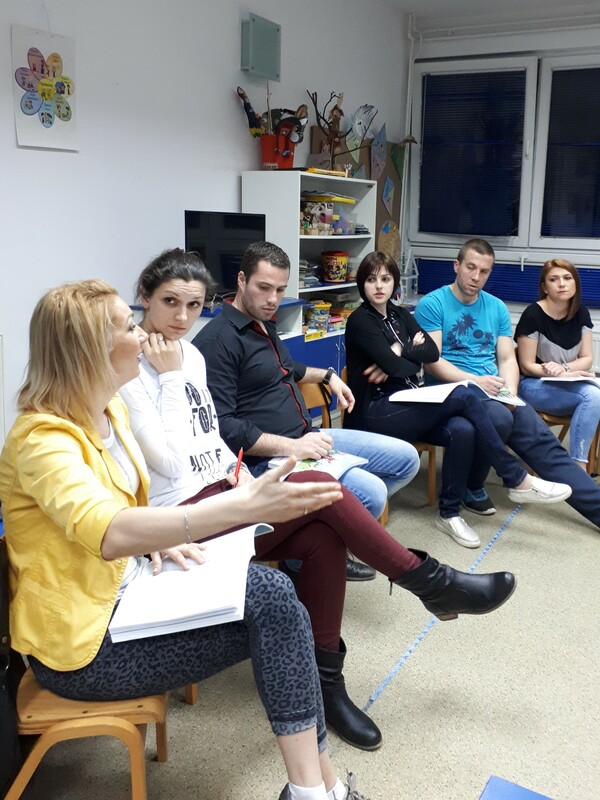 The workshop was held in Pionir, a pre-school center, and it was moderated by our own Smiljana Grujic and facilitator Marko Radivojevic. This time, the topic was children’s unacceptable behavior and how parents should act in those situations. In the beginning, everyone shared what they thought was an unacceptable child behavior. Parents gave examples familiar to everyone: when children speak over their parents, when they want something bought for them and they insist so much that they throw a tantrum at a retail store and demand from parents to do it right away, when they make faces to draw attention to themselves, or when they pretend not to hear and do not answer when we call them. Afterward, Smiljana asked them what they had done or had said in situations such as those. Then, the Support, Not Perfection program once again proved that it was not only a chance for parents to get some suggestions. It was also a space where they could express their feelings. “Well, what can I do! I tried to calm him down multiple times, but in the end, I had to raise my voice. Even though I know I shouldn’t. So in the evening, I complained to my husband how I broke my promise that I won’t raise my voice at our child.” Other parents immediately applauded her experience confession and said that they too acted similarly in some situations. 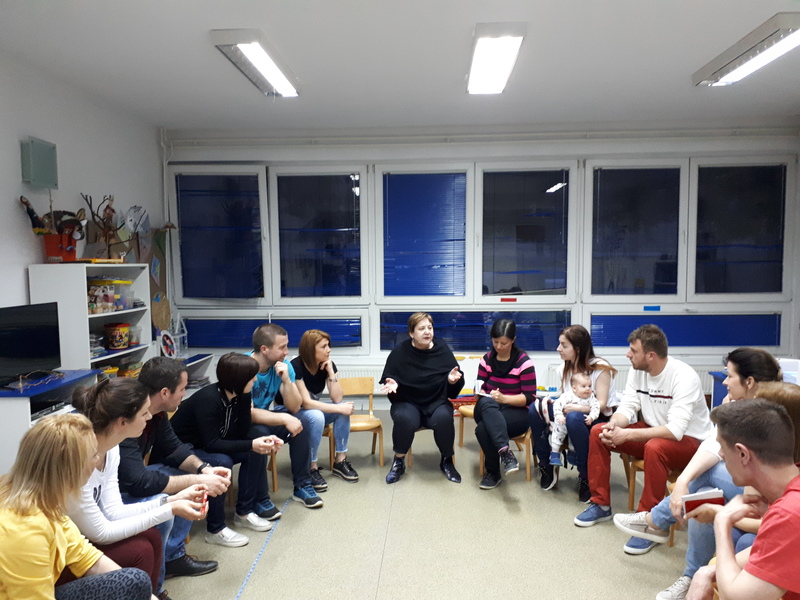 Smiljana Grujic, the coordinator of the “Support, Not Perfection” program and Marko Radivojevic, the facilitator, moderated together the workshop held in Jagodina. After this, Smiljana and Marko discussed some other strategies of reacting to those situations. Parents are mostly angry at that moment. For that reason, it is necessary for them to calm themselves in order to successfully calm the child as well. It is only afterward that they can patiently approach the child, listen to their needs and point out what the parent also wants and why it is good for the child. The key was that the parents did not feel as if Smiljana and Marko were teaching them or pointing out their mistakes. They were simply encouraged to consider some other ways of reacting and choose the one most suitable for them. 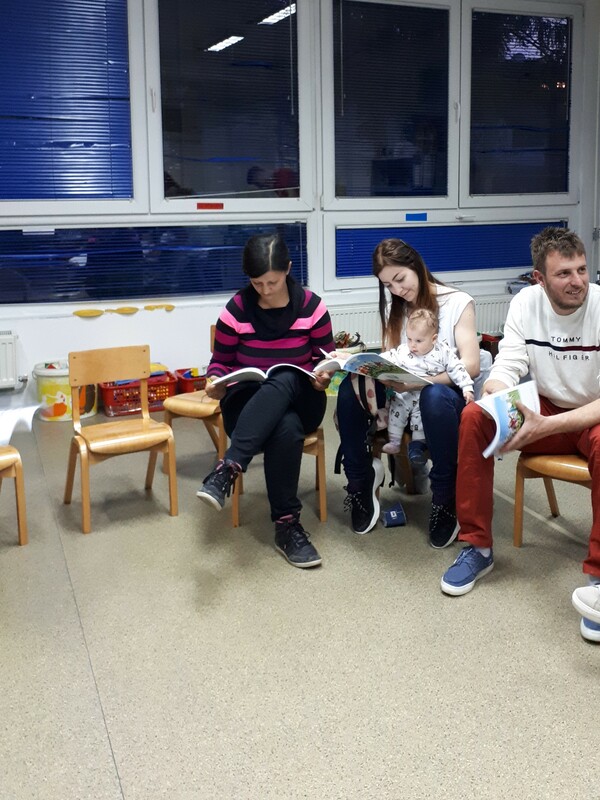 At the workshop, there was also the youngest participant yet – three-months-old baby Katarina! She was present the whole time, resting in her mom Tamara’s arms. Tamara was delighted that this kind of workshop was held in a town like Jagodina. Although Tamara also has three elder children and plenty of parenting experience, she believes more education is always welcome. Especially concerning children. We had a special guest at the workshop – baby Katarina! We also met spouses Borko and Ivana, who come together to the workshop. Borko admitted he was a bit skeptic at first and that he agreed to take part in the workshop after Ivana insisted. “But now, I’m very proud of myself, for opening up in front of other parents more easily than Ivana. And it was already at the first workshop session! We knew that we might have a problem sharing our experiences with the parents we know because we live in a small town. But, we are all so relaxed during the workshop so no one really thinks about that,” Borko is very pleased. This is a special experience for them because they attend the workshop together. It is also beneficial for their own relationship and their relationship with their child. “Now, when we encounter a mutual problem, we can build on everything we heard at these workshop sessions. We agree on things more easily, we understand each other better and set mutual goals,” says Ivana. Participants in the workshop were very motivated to share their experience. Also, one example that dad Ivan gave us was really amusing. He said that when he was with children, facilitator Marko would appear before his eyes and give him suggestions. “I was drawn in right away by the tagline: “There are no perfect parents, only the right ones”. It motivated me to realize that my child is not the only one who sometimes behaves inappropriately. It happens to other parents and other children, too. That’s why exchanging experiences with other parents inspires me to consider if I have acted properly or if I could act like some other parents in the future,” Ivan says. That is exactly what facilitator Marko wants for parents to take from our workshops. He wants parents to know that they are not alone. He wants them to maintain that connection and be aware that they can ask each other for advice. In the end, someone usually volunteers to tell their experience at the next workshop related to its topic. A mom volunteered right away, excitedly saying that something similar had happened to her before and that she could not wait to share it with others. Smiljana asked them to explain in one word what they thought about the workshop that had just been held. Moms and dads said the workshop was a change for them, building on, inspiration and amazement. Parents went home motivated and with their “lightbulbs on”. And we all kept Smiljana’s kind words in our hearts: “This is a one-of-a-kind experience for me – to have a baby present at the workshop. After this, everything gets greater purpose and importance. So, thank you baby Katarina!”. Support, Not Perfection program has been active for two and a half years, and the 5th cycle started in March. In addition to attendees, the workshops also include 34 facilitators and 22 tutors organizing activities with children, while parents are at the sessions. The goal of the programme is not to make perfect parents/guardians out of the participants, but to empower them with knowledge, skill, and support they can rely on.